If you don’t, I hope I convince you too. It’s crunchy, aromatic, slightly spicy and is perfect to eat in salads, warmed in pastas and even chopped as a garnish. It’s the green I love most. Every single week, I grab a bag from the produce section and keep it in my fridge. This tasty green is a pleasant little pantry staple. Shallots, lemons, cheese, olive oil and balsamic vinegar are also kitchen essentials. It’s these basic ingredients that help make meals on the fly doable. That’s how one of my most favorite go-to side dishes was created…on the fly. 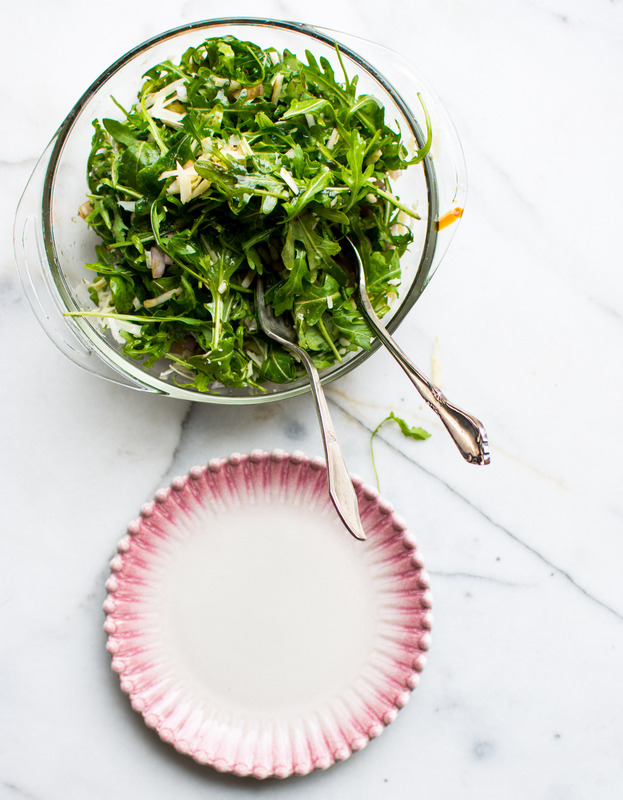 Arugula Salad. The ingredients are nothing fancy, but are always in my pantry. And when combined they turn into “I can’t stop eating this” salad. If I’m in the mood to add more veg (and it’s readily available), I’ll add cucumbers, tomatoes and pine nuts. However, these additions are not necessary. This recipe makes my heart skip a beat because there’s little effort for huge reward. 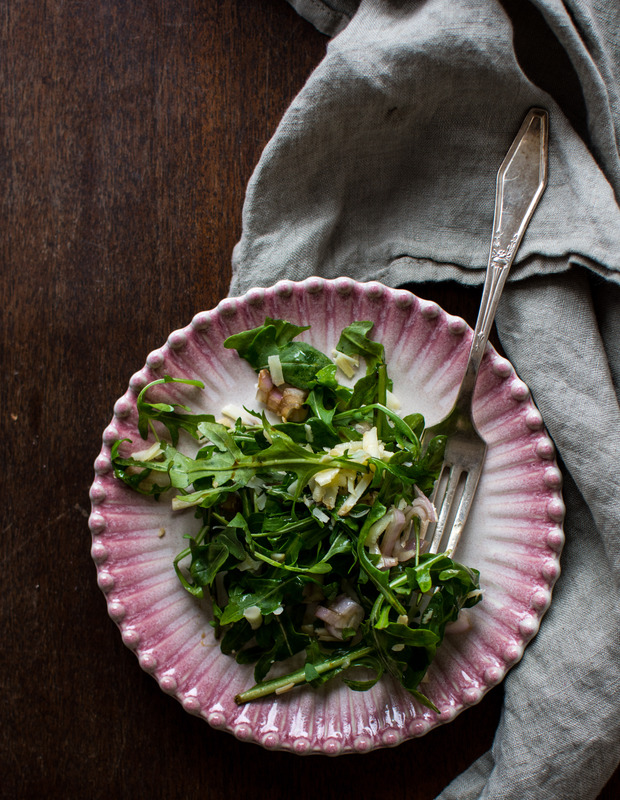 The arugula is prewashed, the cheese is already grated and the shallot is the only item needed to be chopped. 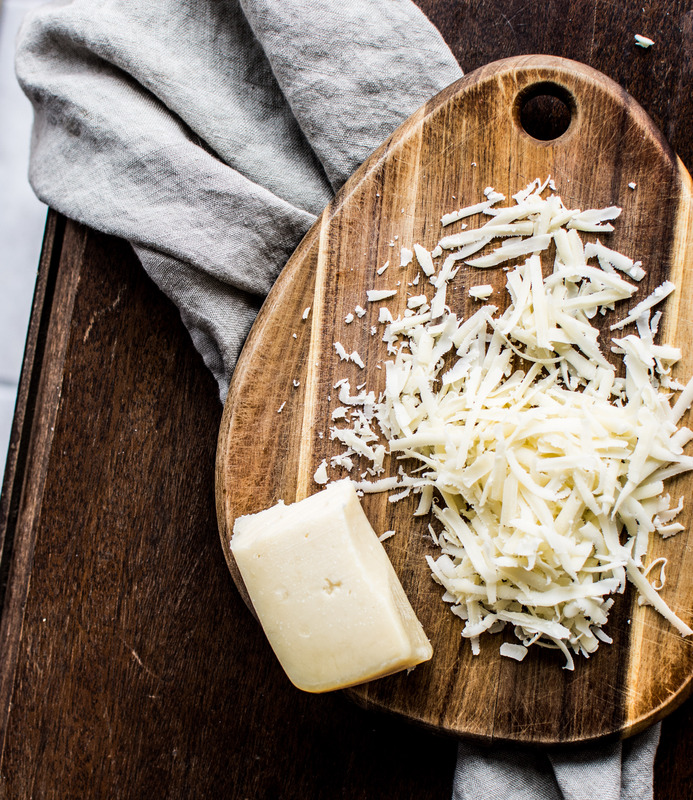 Didn’t pick up pre-grated cheese this week? That’s okay. It will take a few minutes to grate your own. No shallot? An onion will work just as well. Run out of balsamic vinegar? No problem. 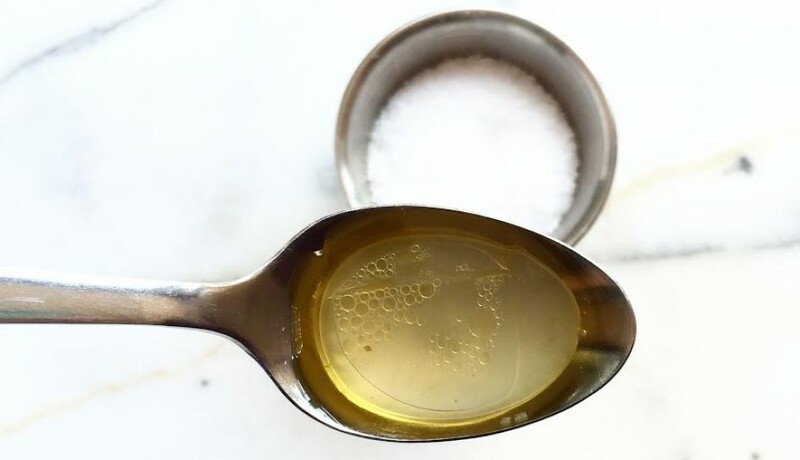 Skip this step or use a red wine vinegar instead. 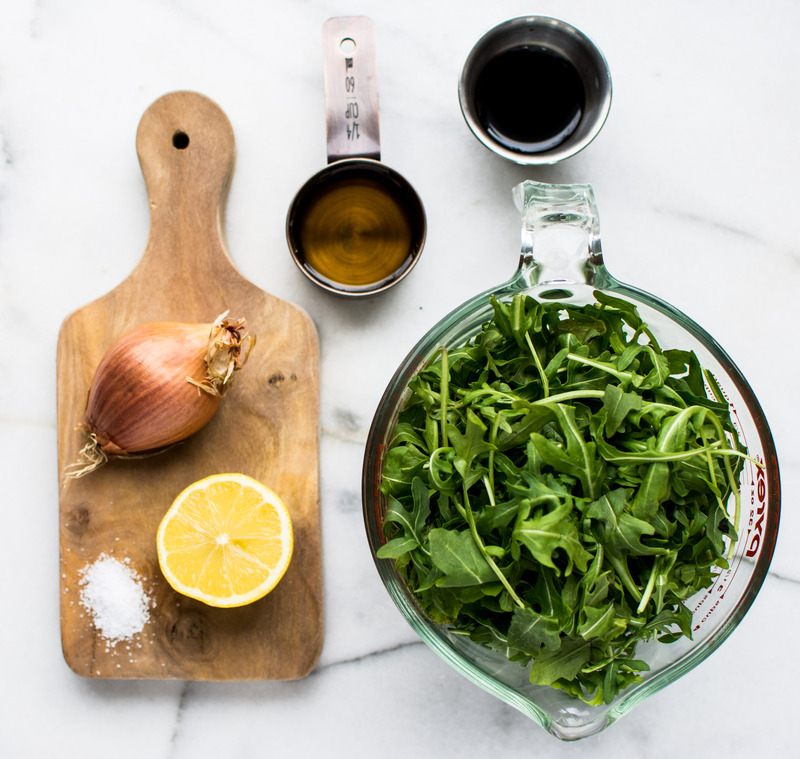 If you prefer spinach over arugula, use it! 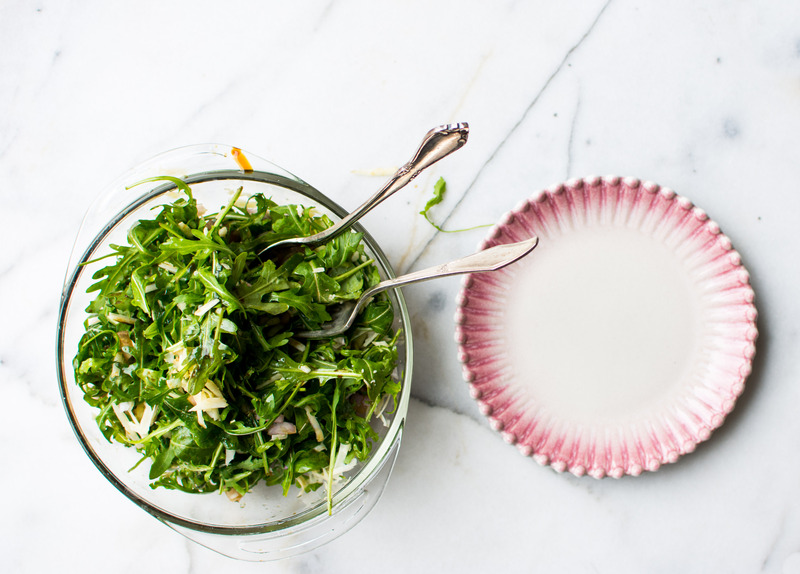 Folks, this salad is versatile. The purpose of this salad is to remind you that a quick side dish can be delicious AND full of quality ingredients. It doesn’t have to be frozen or from a box. Before you head to the market this week make a quick inventory of your kitchen. Is there a green in your fridge? Do you have a versatile vinegar and olive oil? Is there at least two onions and two lemons? Is there quality cheese? If not, add it to your list. So let me rephrase that first question. Do you keep a stocked pantry? You should, and make sure you include arugula. Author note: This salad is incredibly flexible. Add whatever bits of herbs and vegetables you have lying in the fridge. Nuts or a boiled egg would turn this side dish into a protein rich meal. Gruyere, manchego, goat cheese or feta also work very well with this salad. 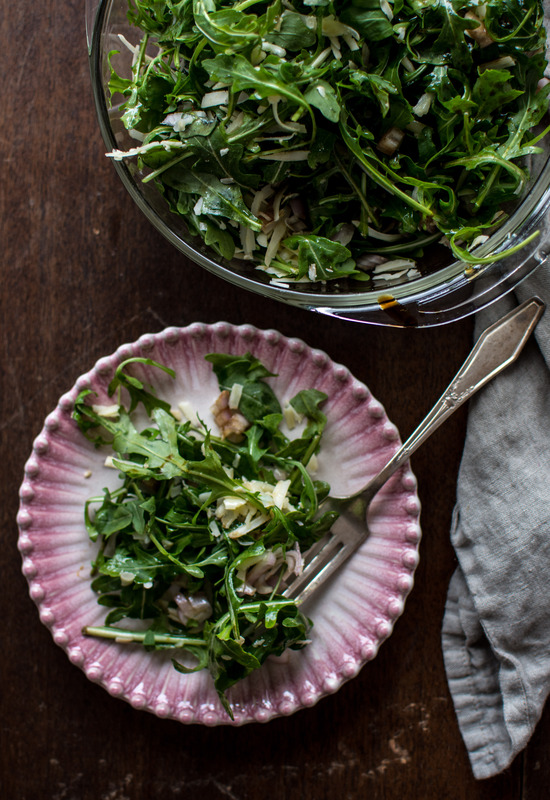 Add the arugula, shallots and cheese into a large bowl. Top with the vinegar, oil, lemon juice and salt. Toss well and serve immediately. This entry was tagged a pleasant little kitchen arugula salad, arugula, Arugula Salad, arugula salad recipe, dallas food blog, dallas food blogger, stocked pantry, texas food blog, texas food blogger, what to keep in your pantry, what to make with arugula. Bookmark the permalink. Thank you! 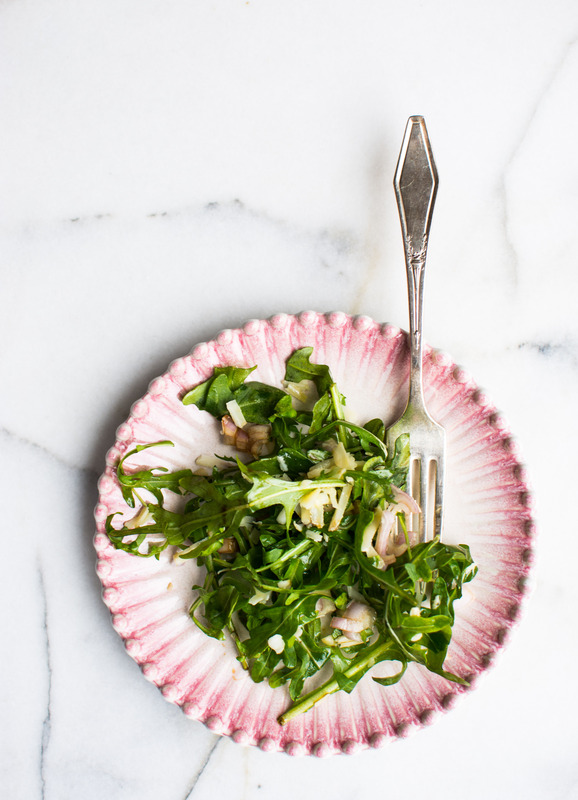 Arugula is the best!